Make no mistake, the Pittsburgh Penguins were a debacle following the 2013-14 season. It was that summer that the Penguins would overhaul their front office and hockey operations department. Out was general manager Ray Shero, and eventually head coach Dan Bylsma as well. In the general manager’s seat was Jim Rutherford, formerly of the Carolina Hurricanes. Rutherford’s first few months on the job with the Pens was tenuous, to say the least. It took him two tries to land a head coach, and most would argue that it was never a good hire in the first place. His first free-agent signing was defenseman Christian Ehrhoff to a one-year, $4 million contract. At the time, the Penguins were believed to be riddled with defensive depth. Many scratched their heads at the Ehrhoff deal, considering the gluttony of other needs within the organization. The James Neal trade that summer at the draft is one that I still believe the Pens could’ve gotten more from. Patrick Hornqvist has certainly been a nice addition to not only the team on the ice, but also in the locker room. Nick Spaling also came over in the deal, and he’s now in Toronto thanks to the Phil Kessel trade. I maintain that Rutherford should’ve gotten Nashville’s first-round pick in the 2014 Draft. Then came the Steve Downie signing. At first blush it seemed like a good fit. Downie was a player considered to be a mediocre offensive threat with some tenacity. As it turned out, all Downie did in Pittsburgh was rent the Penguins’ penalty box in whichever building they happened to play on a given night. To make things worse for Rutherford as the campaign wore on, he had mismanaged the salary cap so badly that the team was forced to play with only five defensemen (17 skaters total, one short of the typical 18) for a small stretch of games because they had no financial flexibility with which to call up another player. Boy, what a difference a year makes. Rutherford is notoriously patient when it comes to head coaches. 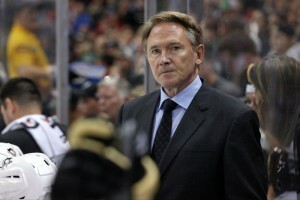 So terminating Mike Johnston after nearly the equivalent of a season and a half was a break from the norm. In doing so however, Rutherford essentially admitted the mistake he made by hiring someone with zero NHL head coaching experience. He’s a loyal man, and this decision didn’t come easy. He thinks the world of Johnston, but even after a hot end to the month of October, Rutherford knew a change was needed. Rutherford also hired assistant Gary Agnew away from the St. Louis Blues, before firing him along with Johnston. The fit with this team’s personnel and Johnston was just never right. Johnston is a system and structure guy who doesn’t exactly preach a play-to-your-strength style; nor does he preach creativity. Rutherford rectified that mistake on Dec. 12 with Johnston’s and Agnew’s firings, and subsequent hiring of then Wilkes Barre/Scranton head coach Mike Sullivan. Heading into this season there were still questions facing the Penguins. Were they big enough? Were they tough enough? The answers to both of the questions was a resounding “no.” It’s what Rutherford did NOT do that made the Penguins what they are currently. Literally during Mike Sullivan’s first game as bench boss of the Pens, Rutherford sent oft-maligned defenseman Rob Scuderi to Chicago in exchange for Trevor Daley. A trade that will be celebrated in Pittsburgh for years to come, not to mention questioned by every hockey expert in North America. Daley brought more mobility and puck-moving ability to a blue line that already featured the likes of Norris Trophy candidate Kris Letang, as well as Olli Maatta. What Daley did not bring however, was more toughness or size. Then came the Carl Hagelin acquisition in exchange for David Perron and Adam Clendening. Again, adding Hagelin did not bring any more size or toughness. At the trade deadline Rutherford was mostly quiet. He added once-highly-touted-but-now-confidence-stricken former Oilers defenseman Justin Schultz. Another player who lacks size and that oh-so-coveted toughness that Penguins have been screaming for for years. Could Rutherford have added more size this season? Sure. Could he have added more toughness? One could suppose. The questions that must be asked though are: would it have been enough size? Enough toughness? Rutherford recognized this team’s strengths at just the right time. Its speed. Its creativity from its superstars. With the additions of Daley, Hagelin and Schultz, Rutherford enhanced those qualities. Rutherford has always been about speed and creativity. Just look at his Carolina teams of the 2000s. Rutherford was never a guy who believed in having one of the toughest teams. He’s always been about skill and speed. When you look at his Hurricanes teams, their biggest problem was they just never had that world-class player like Sidney Crosby or Evgeni Malkin to get them over the hump. But now here in Pittsburgh, he has it all. He has built one of the fastest teams in hockey, and done so around some rather transcendent players. In building this team, Rutherford has also been smart enough to let the organization’s youth get a fair look. To quote a terrific 1990s hair band (Skid Row), it’s “Youth Gone Wild” here in Pittsburgh. Bryan Rust, Conor Sheary, Scott Wilson, Tom Kuhnhackl, Oskar Sundqvist. Let those names sink in for a minute. All have had a great impact on this team. All are under the age of 25. All of this was under Rutherford’s hand. Adding to this, he also made the right decision in naming Sullivan to succeed Johnston. Do not for one minute underestimate the impact that Sullivan has had on the call-ups. Having spent three months coaching them in Wilkes Barre/Scranton, Sullivan has known exactly how to get the most out of those young players. The Pittsburgh Penguins — ever since the Lemieux era began — have been about scoring and entertainment. Since Sullivan took over and the rectification by Rutherford began, the Pens are the highest scoring team in the league. Crosby has been nearly unstoppable. Letang is finally playing like the defenseman that many around hockey thought he could be. The Penguins are the Penguins again. It’s because Jim Rutherford is Jim Rutherford again.